As evidenced by the title and philosophy behind this blog, I am not a big fan of the “have it all” mentality for modern moms. To be frank, the idea of “having it all” sounds downright exhausting to me. Instead, I’m trying to embrace the Pick Any Two philosophy, which is all about examining your personal values and beliefs, and then prioritizing your activities to match. If your kids are important, then quality time with them beats having a clean house. If you value exercising, then you pay for your gym membership even if it means you can’t afford new clothes. 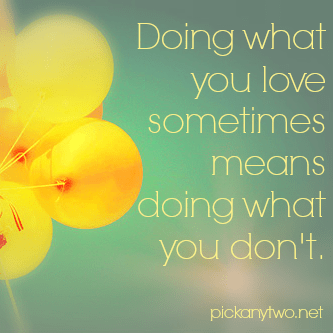 In other words, instead of trying to do it all, I think you should just do what you love. Tweet this! It sounds quite lovely, doesn’t it? Doing what you love all day long. Just rainbows and butterflies and long walks on the beach, right? I work with a nonprofit that offers free counseling to victims of domestic violence and sexual assault. The counselors who work there are downright saints, giving so much of themselves for barely any pay because they want to make a difference. Ask them why they work there, and they’ll tell you: They’re just doing what they love. Doing what you love sometimes means doing what you don’t. Tweet this! Now there’s a great perspective. I love taking care of my toddler, which means stinky diapers and mashed potatoes in my hair—both of which I don’t exactly love. I love feeling healthy, so I wake up 5:30am to exercise, even though sometimes I’d really rather not. I love having a close relationship with my husband, which means listening attentively when he talks about the latest developments in computer programming—more his passion than mine, for sure. I love writing a high-quality blog, which means engaging in marketing and self-promotion efforts that are outside of my realm of expertise—not my favorite thing to do. Doing what you love doesn’t mean life is going to be easy. It doesn’t mean you aren’t going to get stressed or frustrated or exhausted sometimes. Sometimes doing what you love means doing things you don’t, and that’s not a bad thing. Because in the end, those things you don’t love make you stronger and bring you closer to those things you do. Is there something you love to do that also requires doing something you don’t love quite so much? That’s how I feel about taking care of a toddler. I love days when I’m off work, home with my son, and able to give him my “best”, but I hate the boredom factor (ie reading Hop on Pop for the 400th time). On the other hand, I like to go to work and challenge my brain, but I hate being exhausted in the evenings and frustrated and impatient. There are pros and cons to everything, for sure! I love being a parent, but I don’t always love parenting! I think you’ve got a great perspective on this. Life isn’t always just sunshine and roses. There are tough parts to deal with. Hasn’t it been said that you can’t appreciate the sunshine without having experienced the rain? I had a talk similar to this with my 6 year old son recently. He was complaining about the chores (laundry) I asked him to do and I was frustrated with him. The most frustrating part is that he threw a 20 minute hissy fit over what turned out to be two pairs of pants, three pairs or underpants and a shirt that needed to be put away. I agree with Rabia. I love being a mom, but it’s so hard! There are days when I honestly feel like I’m never going to make it. Love your post! And I think it’s really important to acknowledge and recognize those days! Doing so makes them easier to handle. Absolutely and the key for me is being grateful for some part of the thing or situation which shifs it entirely. Another would be that I love working from home with my hub, but some moments I wish for a “normal” schedule. Then I remember that our works-for-us schedule allows us family beach adventures at random times of the day which would be impossible if we had “normal” schedules, and I’m grateful for our totally us lives and time together. Love this point. It’s not just about having the positive outweigh the negative, it’s also about finding the positive WITHIN the negative. Great insight, Wendy, as always! Oh, so much. I think I thought it would all be sunshine and roses. Just everything. Parenting is like you described. I love it, but I don’t love illnesses, whining, stepping on Legos, and stinky diapers. Photography. I love it. It’s my chosen career. I don’t love negotiating payments, cleaning lenses, or working with difficult people. There’s a give and take for it all. There is a lot of truth here, Katie. I’m trying to do more research when I have time and embrace the marketing and promoting side of blogging too, which is not my favorite thing to do either, but I know it’s necessary if I want my blog to reach a bigger audience. Great post! I know, right? It really hit home for me too. Katie, I love eating really good food made from scratch. But it takes a lot of time and work: planning, shopping, then prepping, cooking… I always joke with my husband that it never takes us more than half an hour to finish up a meal that took 1-2 hours to prepare when you count every step it took to get that meal on the table. And then there’s the cleanup! But when I’m grumbling on my way to the grocery store or while I’m laying out five different bowls of prepped veggies and protein, I remind myself that the payout (know exactly what we’re eating!) is totally worth it! Oops, I managed to place my post as a reply to another thread. Sorry about that! No problem! You’re so right that hours of work and prep can be eaten in a matter of minutes. But the long-term payoff in terms of our health extends far into the future. The more I thought about this phrase, the more I realized I could apply it to almost every aspect of my life! Such an interesting perspective. Glad you could relate! WOW, we have so much in common! I’m so glad I found you and your blog, because it really does seem like we are kindred spirits in many ways. The devil’s in the details, as they say! I, too, spent many years working in the nonprofit world. At the end of the day, it has to be about the satisfaction of helping your fellow man because unfortunately such careers don’t pay high salaries. It takes special people to advocate on behalf of others. I think your philosophy makes a lot of sense. I should think of this when I feel bad about missing a movie I wanted to watch or a book I wanted to read. On the other hand, I’m blessed to be a mom. It’s admirable that you’re helping those who really need help. Right now I am doing some things I don’t really care to do because they are a means to getting to do what I love! I really enjoyed your post because I think a lot of people waste time due to a lack of understanding that one choice often obligates us to another choice we won’t enjoy quite so much. This is such a great topic, Katie. I like your perspective on gains and losses: You play with your kids (gain) so you let the dishes pile up (loss). Something has to give, right? We can’t be everywhere at the same time. I think you truly do love something when even the grunt work of it is something you can still enjoy. Even the effort and work are worth it and somewhat even fun. I agree, Nina! There have been times when I’ve surprised myself by how much I come to enjoy the grunt work of a particular task or project, just because it’s supporting a final product I truly love. Stephanie @ Mommy, for Real. This is great! I’m a newcomer to your blog, and I love this philosophy. Trying to do it all, have it all, only sets moms up for failure and disappointment. This is refreshing! I’m glad you can relate, Stephanie. I love your blog and look forward to connecting more! I know a woman who always says “Don’t do it if it’s not fun.” Well, I wouldn’t be doing a lot of things in life if I followed that rule. Not everything is always fun. Parenting, work, etc. It’s all a part of life. I think this can apply to almost everything in my life. I love to eat chocolate, but I don’t love the calories. So I exercise, which I don’t love, but I love feeling healthy and fit. I know that’s kind of a silly example, but it’s true. If you love something enough, doing things you don’t love is a small tradeoff. Exactly! The tradeoff becomes worth it. Great perspective. Parenting is so rewarding, yet there are so many things that I hate doing as a mom. But’s it’s all worth it. It’s never easy. I don’t think you can have it all. It’s always a trade off. My house is always cluttered. It’s not a priority. I wish I could say it was, but it’s not. I’d rather spend time with the kids and my blog and my work. It’s all about making those choices. In the end, I don’t think you’ll regret having a cluttered house! Right after this, I’m going to do some marketing so tonight I can eat chocolate and stare at dust bunnies, knowing that I actually did something to further my goals. 🙂 Great post, Katie. I totally agree with this, and sometimes it’s hard to deal with. I have so many things that I love doing; I sing in a band, I blog, I do freelance writing, and of course I love everything about my son. And in order to enjoy all of these things I have to work a 9-5 job doing something I’m good at but not something that I love. I am lucky that I can keep this in perspective most of the time, but I definitely need some reminding. Oh, this is so powerful, Katie. It can sometimes be hard to remember that doing what you love isn’t always sunshine and roses – and sometimes this makes it feel like we’re not walking the right path. But your wonderful perspective on this can help us get through the bits we don’t enjoy so much so we can really pursue what we love.